Confused by Russia’s role in the election? The New York Times in this piece has explained it for the layman. Confused by all the news about Russia and the 2016 presidential election? Read this article filled with diagrams to help understand all of the links and connections. Twitter has fast become the site for Rouge Resistance in US government agencies. There is no way to verify who is posting from each account; and because the larger agencies like NASA and the EPA have multiple rogue accounts, we have to follow, listen, see and thoughtfully decide for ourselves what is real and what is fake. Unofficial unaffiliated resistance account by concerned scientists for humanity. He can take our official Twitter but he’ll never take our FREEDOM. UNOFFICIALLY resisting at the @EPA. The Unofficial “Resistance” team of U.S. Environmental Protection Agency. Not taxpayer subsidised! Environmental conditions may vary from alternative facts. Ungagged news, links, tips, and conversation that the U.S. Environmental Protection Agency is unable to tell you. Not directly affiliated with @EPA. We are a #Resist sect of the National Aeronautics and Space Administration. The unofficial “Resistance” team of NASA. Not an official NASA account. Not managed by gov’t employees. Come for the facts, stay for the snark. The unofficial #resist team of the National Aeronautics and Space Administration. Unofficial group of science advocates. Stand up for science, rights, equality, social justice, & ultimately, for the health of humanity. Parody Account. USARC’s main duties are to develop an integrated national Arctic research policy and to assist in establishing an Arctic research plan to implement it. Resisting the censorship of facts and science. Truth wins in the end. The unofficial, and unsanctioned, “Resistance” team of the U.S. Forest Service. Not an official Forest Service account, and not publicly funded! The Unofficial Resistance team of U.S. National Weather Service. Not taxpayer subsidized! Come for non-partisan science-based weather, water, and climate info. You’ll never shut us down, Drumpf! Unofficial feed of Badlands NP. Protecting rugged scenery, fossil beds, 244,000 acres of mixed-grass prairie & wildlife from two-bit cheetoh-hued despots. Shmofficial fake feed of South Dakota’s Badlands National Park (Great Again™ Edition) Account not run by park employees, current or former, so leave them alone. The unofficial Twitter site for Glacier National Park of Science Fact. The alternative Twitter site for Glacier National Park. The Resistance Account of America’s First Resort and Preserve. Account Run By Friends of HSNP. The Unofficial “Resistance” team of Hawaii Volcanoes National Park. Not taxpayer funded. The Unofficial “Resistance” team. Within peaceful mountain forests you will find hissing fumaroles and boiling mud pots and people ready to fight for science. Official #Resistance Team – We are the voice of the #Mountain! Supporting @NotAltWorld. Not taxpayer subsidized! Run by Non-Govt Parties. Unofficial resistance team of the Olympic National Park. protecting what’s important and fighting fascism with science. Unofficial account that is being held for people associated with RMNP. DM if you might be interested in it. Unofficial Resistance Team. Not officially associated with Yosemite National Park or the National Park Service in any way. Unofficial and unaffiliated resistance account by concerned scientists for humanity. Parody. Preserving the ecological and historical integrity of National Parks while also making them available and accessible for public use and enjoyment dammit all. Uncensored & unofficial tweets re: the science happening at the @EPA, @USDA, @NatlParkService, @NASA, @NOAA etc. Are You Fired Up? Ready To Go? It is time to be on watch. Each one of us must pay attention in this new post truth era. Get active, use your voice. We have to tell congress that we are no longer asleep at the wheel. For my Arizona friends and neighbors I have compiled a list of AZ Senators and Representatives. Every time we feel like something is crazy, ill considered or down right dangerous we have to call them and let them know that we at home will keep them accountable. If you don’t live in AZ compile your own list, for your state and share it. Email Them (via their websites)! Will you be in Washington DC on Monday Oct 24th, 2016? Come to the ASU sponsored Future of the American Dream town hall hosted by futurist Brian David Johnson. This event is focused on civil civic dialog. With only a few weeks to go in the most contentious American election in history we could all use the opportunity to voice our thoughts on how we see the American dream in our own futures. Join us! Your vote matters. I know sometimes it feels like it doesn’t, but if every registered voter got out and used their right to vote you could actually have your voices heard. It is so important to remember that as a US Citizen this is a right totally taken for granted. Ask yourself “What would it look like if my right to vote was taken away”? Use it or lose it! 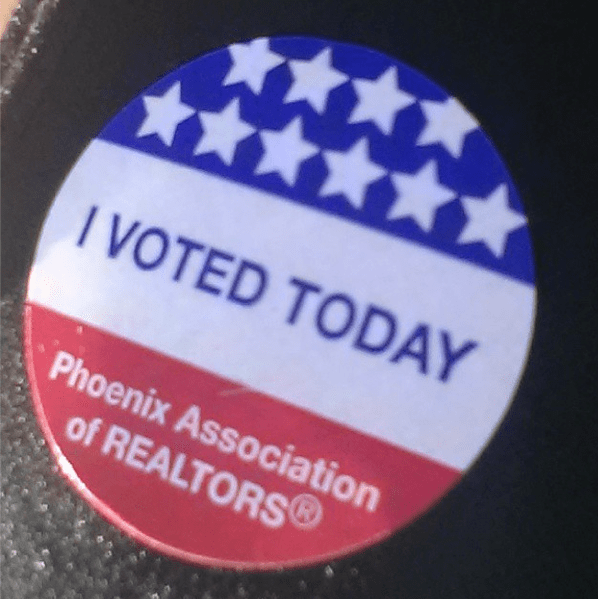 Get out and Vote today! (New York, NY) – Sheryl Sandberg, COO of Facebook and author of Lean In, headlines at the Take The Lead launch of a new initiative to prepare, develop, inspire, and propel women to take their fair share of leadership positions by 2025. The ticketed event takes place February 19, 2014 at Gammage Auditorium, Arizona State University, Tempe from 6 to 8:30 p.m. MST. It is open to the public and available FREE, nationwide on-line livestream. The program is sponsored by Take The Lead in partnership with Arizona State University. “Take The Lead is the movement for this moment. Gender parity in pay and leadership is good for business and the economy; it’s the right thing to do; and it’s way past time,” said Gloria Feldt, women’s advocate and New York Times bestselling author who is Co-Founder and President of Take The Lead. Amy Litzenberger, former investment banker, is Co-Founder and Chairperson. In addition to Sandberg who will be introduced by the Hon. Barbara Barrett, former Ambassador to Finland, the program features prominent leaders who will inspire, motivate and call to action. Speakers include Karen Finney, host of MSNBC Disrupt , who moderates the panel on Women, Media and Leadership (co-sponsored by the Women’s Media Center and ASU Cronkite School of Journalism), Erica Gonzalez, Editor-in-Chief of El Diario/La Prensa, Pat Mitchell, president of the Paley Center for Media, ASU President Michael Crow and Carla Harris, Managing Director Morgan Stanley. Take The Lead invites all students to attend the launch from all Universities, Colleges, Community Colleges and High Schools in Arizona. Student need only to call or visit ASU Gammage Box Office to present their valid student ID and they will receive a free ticket to the event. There are a limited number of tickets and they are first come first served. Can’t make the live event? Take The Lead expects to reach 1 million virtual attendees through on-line, live-stream. For information about Take The Lead Challenge live stream event visit taketheleadwomen.com and learn how to create your own viewing party.